I would estimate this photograph was taken between 1955-57. 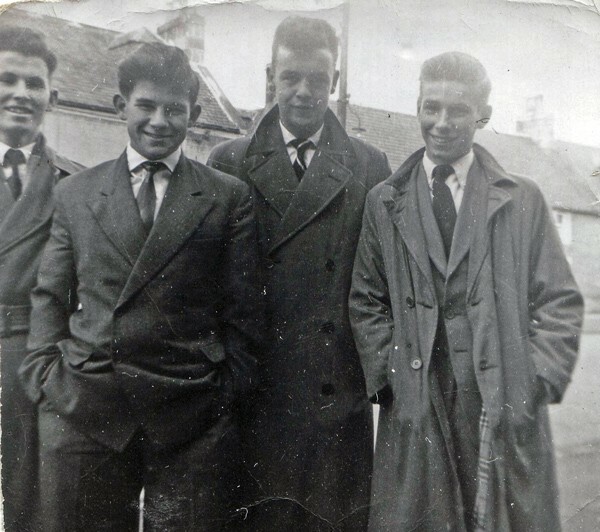 From the left Sandy Maclean, Willie Mackay who lived in Clyde Street, Hamish Urquhart and Donald Macleod (Shortie) who both lived in the High Street. Thanks Harry for your comments! When I sent in this picture I didn't know Shortie had passed away but have since spoken to my cousin Amelia Muckle and she confirmed that he had. This is a lovely photograph of him, I hope one of his family will see it. Hamish was in the police force in Edinburgh or Glasgow but I am not sure where he is now. Willie still lives in Invergordon. I think Sandy Maclean used to live in Tomich. There must have been a dance on at the Town Hall! I don't remember Sandy either but memories of the others came flooding back as if it was yesterday. Doesn't Willie have a real "Scottish" face? The period would be just before Teddy Boys and Rock and Roll hit us, so when you dressed up you wore the same as your dad - no youth culture in those days. Hamish Urquhart was in the police in Glasgow and is now retired and still living there. I can confirm that "Shortie's" son Terry has seen the picture of his father on the site and can also state that Terry's own picture can be seen in picture #883. The family likeness is evident.. I am Shortie's daughter and now live in Glen Etive.... It was really nice to see his picture. We have just had Hamish and Evelyn, Brenda and Willie and Mum down for the weekend so we all had a great time catching up on the past and the present. Think this is a brilliant site, keep up the good work. My eldest son looks very like his grandad, I only wish he was still here to be proud of them. I worked with Shortie in the Distillery for 3 years. He was always up for laugh, but at the same time a very talented mechanical fitter.